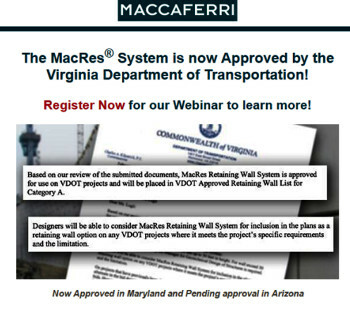 We are happy to announce that Maccaferri Inc. is about to launch a Webinar focusing its MacRes MSE Wall System. The Maccaferri MacRes System is a Mechanically Stabilized Earth (MSE) retaining wall system comprised of precast concrete facing panels and discrete high adherence polymeric soil reinforcing strips. The tensile forces in the soil are transferred to the reinforcing strips by means of friction. The MacRes has been used on many projects worldwide for various applications such as bridges (wing walls and abutments), railways, highways, airports, quarries and other industrial areas. Maccaferri is active in the research and development of innovative solutions and new products for retention works. In launching MacRes, our aim was to add a vertical faced, durable reinforced soil system for demanding infrastructure applications. The soil reinforcement elements are the key components of the MacRes system. Maccaferri reinforcements have been intensively tested since 1976 while our ParaWeb product is NTPEP approved. The design of the MacRes MSE wall system strictly follows the AASHTO LRFD bridge specifications and FHWA recommended guidance. The internal stability design follows the AASHTO simplified method, which is intended for MSE walls with extensible reinforcements. Faster construction: up to 2,100 square feet per location per day. Approximately 5 times faster than the construction and soil placement of a traditional reinforced concrete gravity structure. • High strength polyester soil reinforcing ParaWeb strips encased in a tough and durable linear low density polyethylene (LLDPE) coating available with nominal tensile strength ranging from 6,740 to 25,170 pounds. • The precast concrete facing panels are designed based on a minimum concrete compressive strength at 28 days of 4,000 psi. MacRes panels minimum thickness is 5½ inches. The front face of the concrete facing panels can be finished with a broad range of form liner textures to satisfy a wide range of aesthetic and architectural requirements. • The ParaWeb reinforcements are planar strips manufactured from high tenacity, multifilament polyester yarns aligned and co-extruded with a LLDPE sheath to form polymeric strips. • The ParaWeb soil reinforcing strips are available in a wide range of tensile strengths in order to optimize the design and construction efficiency. • The polyethylene coating allows the use of ParaWeb in highly alkaline environments (pH>11) commonly found in recycled concrete and lime-stabilized backfill materials. • The HDPE MacBox is integrated with the panel by an embedded steel rebar encased in a polymeric sleeve for corrosion protection. The sleeve avoids any intrusion during the casting phase and prevents damage to the polymeric soil reinforcing strips in contact with the rebar. • An alternate polymeric anchor rod (in lieu of a steel rebar) may also be considered with this system. • The geostrips are simply wrapped around the anchor bar. The connection strength has been determined through independent connection/pullout testing programs. For further information on Maccaferri’s Retaining Walls and Soil Reinforcement applications, please contact us.